I’ve lost plenty of games already and there are still 16 teams left to play. As far as I’m concerned, I’ve already squandered my opportunity to win in any of the pools I’m in. But on the opposite end of the spectrum from me sits Florida Gulf Coast University. They, my friends, have already won. A pair of improbable upsets have unofficially branded the Eagles as this year’s favorite Cinderella. In tribute to their success so far, I’ve written a quick piece for Mud, Sweat and Beers — the MatchPint blog. It’s not too heavy and hardly comprehensive, but it’s enjoyable nonetheless. Click here to check it out. It’s that time of year, music fans. The time of year when one rock/alternative band gets to ride the financial wave of the well-timed popularity of a sports related song! Also, it’s March Madness time. Well played Muse. I’m no bracketologist and if that’s your job, you’re the sports analyst equivalent of being a mixologist. But I enjoy the NCAA basketball tournament just as much as anyone. That’s why I branched out to write my first ever basketball blog on the tournament for Mud, Sweat and Beers — the blog of the British website, MatchPint. In all honesty, I covered very little about this year’s tournament in the blog, but it’s a fun little read and there are at least a few bullet points about some stuff to watch for while you’re killing your productivity by watching basketball at work. There will be some additional installments as the tourney goes on so keep checking back after the conclusion of each round for some quick, not so deep thoughts. 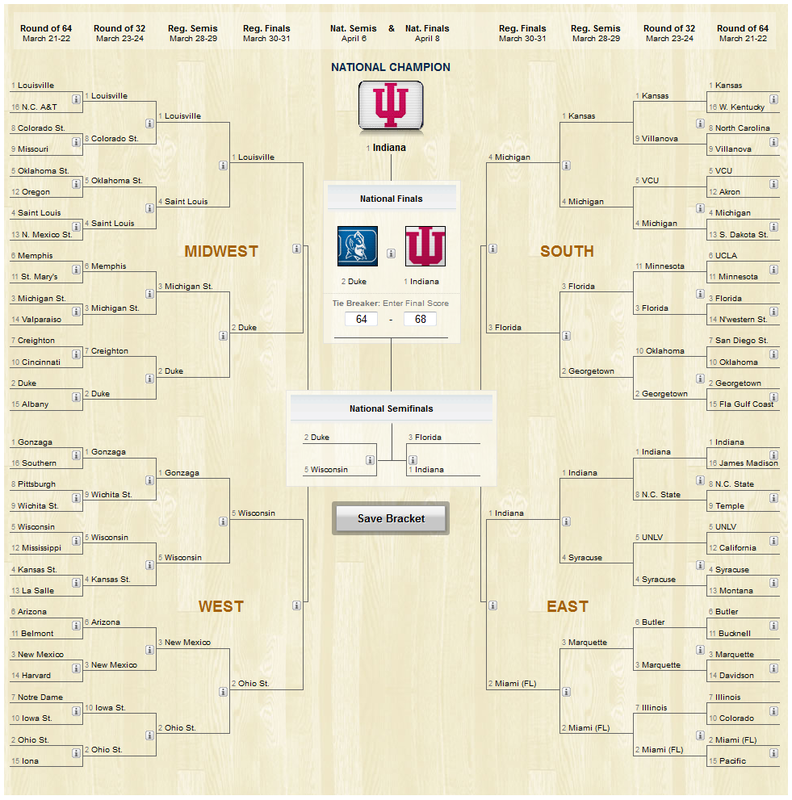 And if you’re curious about my picks for the tournament, I’ve posted my bracket below. There were 147 top-25 upsets in NCAA D-1 men’s basketball this regular season. Here’s every one of them and the ESPN story about it.